This Ramlethal Valentine figure from Guilty Gear is the coolest! I found this Ramlethal Valentine figure while looking at fighting game characters. You know, since they are the coolest. This figure features Ramlethal Valentine from Guilty Gear Xrd -SIGN- in 1/8 scale. She looks ready to tear up some contenders on the battlefield. Ramlethal Valentine is from Guilty Gear check out the newest game right here! What Comes With Guilty Gear Ram? FREEing crafted this Ramlethal Valentine figure and it features Ramlethal Valentine in an action pose indicating she is dodging from an attack. She’s wearing her signature organic cloak. It’s shinier than the rest of the figure which is a detail that makes the figure spring to life in my opinion. Her hat is also removable which is a wonderful detail. Therefore it allows you to show off Ramlethal in different ways. To customize your figure if only just a little. 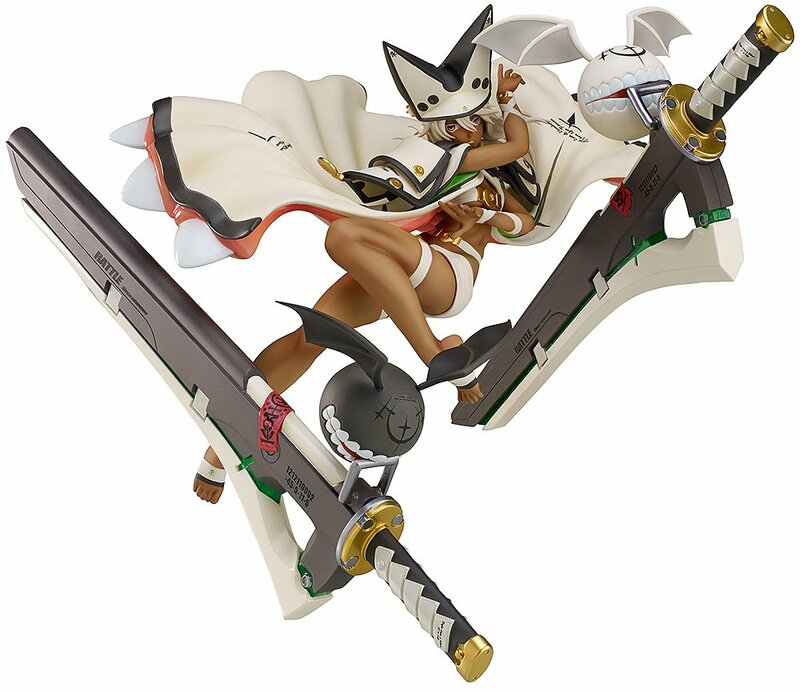 Ramlethal comes with her two familiars called Lucifero which can be attached to the two MASSIVE great swords that come with her. The familiars are already attached to the handles for the swords but, you just clip them into the actual swords. Her familiars have some great details on like the symbols on top and the way they grip the sword handles with their teeth. The swords are really big. I love the size of the swords in comparison to the figure. They indeed do help make the figure look quite ferocious. Some clear pegs are included to rest the figure on. The previously mentioned pegs, that the swords rest on, do have joints so they are somewhat adjustable. The pegs attach to the base that everything sits on. An uncommon pose is this figures best quality! The pose for this figure is totally cool. She looks great. The only thing I dislike about this figure is the clear plastic pegs she is held up by. Since she is in an airborne pose she has to be held up by clear plastic little peg pieces which I am not the biggest fan of. That said I think the trade off is worth it for such a neat pose that you don’t see too often in figures. If I could change it I’d prefer to have it integrated into the base so it’s not this completely alien material to the figure holding her up. Most figures are slight variants of the character standing up or sitting down but, this is a true action pose! By the way, there’s an alternate color scheme for Ramlethal. It’s pink and purple-ish. Amazing job on this Ramlethal Guilty Gear figure! 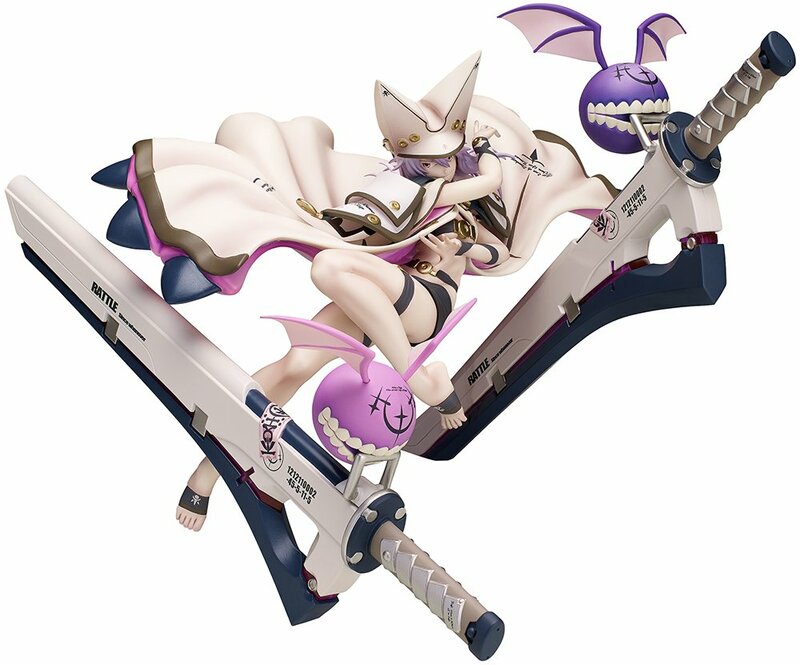 I love this figure, moreover, I think it is really true to how she looks in Guilty Gear. I’d say it stacks up very well with other guilty gear figures. Check out a few other Guilty Gear figures I’ve written about Ky Kiske and Sol Badguy!